That whim—maybe music will protect me from bullies—spurred James to ask his parents for an electric guitar, which he received for his eighth birthday, despite his parents’ reservations; they, according to James, were worried about the electric guitar music he was listening to, falling prey to the stigma surrounding the heavy metal genre. He convinced them to let him listen to instrumental heavy metal; he became obsessed with the guitar performances of Joe Satriani, practically wearing out the CD. 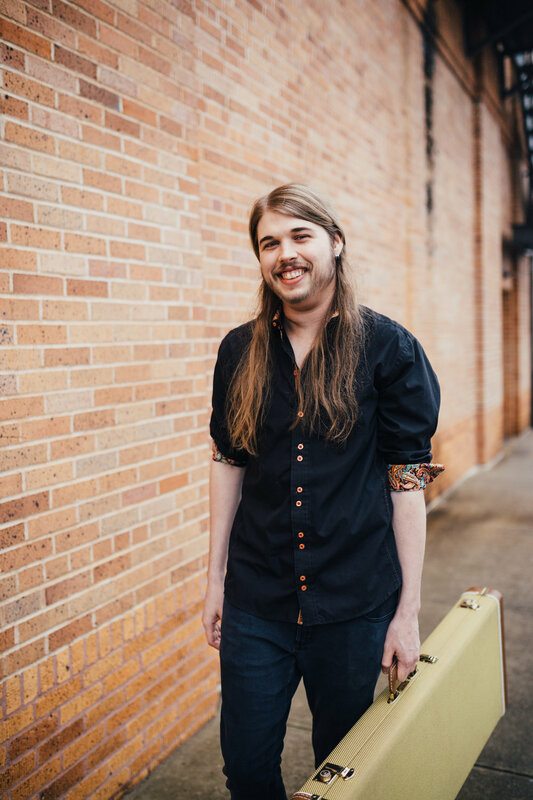 At age 10, having convinced his parents of his passion, they enrolled him in guitar lessons with local teacher Joe Schafer, under whose guidance James began writing his own music. Unfortunately, picking up an instrument was not the key to social acceptance that he thought it would be, but learning to write music did prove a way for James to deal with being bullied. “Music for me was the first way I learned to ‘hit back,’” he says; he wrote and played songs that allowed him to vent his pain, frustration, and anger. Mark’s influence on James is clear; James says that, even now, as a seriously-trained musician and adult, he’s “still scared of Mark Kerr,” referencing his healthy respect and fear for him. But merely participating in lessons is not what propelled a teenage James into excellence; even as a kid, James’ devotion to the guitar transcended the rehearsal room. “I wasn’t very popular ever,” he says. “I didn’t have many friends to hang out with. So while everybody else was doing typical teenager stuff, I was sitting at home, playing guitar until I fell asleep. That was pretty much middle school through high school.” He remembers taking his notes from guitar lessons, pouring over them at home, and even studying them at school, hiding his guitar book behind his textbooks. This memory prompts a nugget of wisdom that foreshadows James’ future career: “You can have the best teachers in the world,” he says, “but it’s only about as valuable as what you want to put into it.” James would go on to have, quite literally, the best teachers in the world, at Boston’s Berklee College of Music, the nation’s largest independent college of contemporary music and the home of guitar legends. One day near the end of his third year of university, James received a call from his father, who informed him that he had an audition scheduled at Berklee in four days. “I told him, ‘You’re aware that people spend a year or two years practicing just to audition there, right?’” James remembers. He says they even got into a bit of an argument, no doubt fueled by nerves. Nevertheless, he spent the next four days engaged in nonstop practice, fueled by “lots of Red Bull.” They flew to Boston for the audition, and he was accepted—provisionally. Due to his poor grades, he would be held to higher-than-normal standards upon enrolling at Berklee: during his first semester, he would have to maintain a 3.6 GPA, obtain letters of recommendations from all of his professors, and prove himself worthy of being retained. Up to the challenge, he maintained a 3.98 GPA, impressed all of his instructors, and was in the handful of provisional students allowed to stay. Over the next eight semesters (consecutively squished into two and a half years), James managed to take lessons consistently with Stump, a feat requiring much persistence, since everybody wants a spot in his classes. He also took lessons from renowned jazz drummer Kenwood Dennard, whose notable credits include playing with Miles Davis. He graduated in December 2015 with a bachelor of music degree. He moved back to Texas, stopping over in Texarkana for a few months but ultimately moving to the Dallas area, where he worked to break into the DFW metal scene. He was initially crashing on friends’ couches, but once he gained employment as a guitar instructor, he was able to obtain his own apartment. Every day, he would work his eight-to-five at Dallas’ School of Rock music institute, and then hit the music scene, playing open mic nights until as late as 4 a.m. It was a year of nightly “open jams” until he landed his first gig, thanks to a Berklee friend who was touring through Dallas and needed an opener. He finally had his foot in the door; his career was beginning. Unbeknownst to James, however, another life journey was just beginning as well. What started as a persistent mouth ulcer developed into stage IV oral cancer, which required the surgical removal of the lymph nodes in the right side of his neck and one fifth of his tongue, as well as weekly chemotherapy and five-days-a-week radiation. His mom and girlfriend moved to Dallas while he endured treatments at UT Southwestern. His dad drove in every Monday, “Chemo Day,” and his sister, who was in college at Rhodes in Memphis, flew in on the weekends. This team kept him taken care of, for which he is immensely grateful, often reflecting on his good fortune concerning his family. He tried to keep up his guitar practice throughout treatment, but that became physically impossible. What was once a seven-hour daily practice dwindled to three hours or less, inconsistently. But when he couldn’t play, he composed, and he spent many hours listening to others’ work. It wasn’t until the second week of January that James was “talking and coherent again.” Since then, James has continued to see improvements in his health. He is beginning to feel better and is working to build his daily practice back to five hours. Living with his parents and focusing primarily on recovery, James has had a lot of time this year to reflect — on his struggles and triumphs, his weaknesses and strengths. One seeming double-edged sword in James’ life is his Asperger syndrome, which he was diagnosed with as a child but only informed of when he was 17. “For a while I was kind of embarrassed of it,” he admits, “but I did a lot of research, and once I figured out how to use it to my advantage, it was like, ‘I love having Aspergers.’ Aspergers is probably the reason I can sit down with the guitar for five to seven hours and not get bored.